Don't make food safety an afterthought. Carefully planning the design and materials used in your plant can help insure the safety of your food production. Disruptions to the safety of the food supply comprise the most dreaded “accidents” the food industry faces. Yet history shows us there is no such thing as an accident. Time after time, investigations of food contamination lead to the conclusion that the crises were largely avoidable and that they often stem from faulty designs or construction materials that invited disaster. Food safety is, indeed, the most important issue any food company faces year-in, year-out. Its importance to public health, coupled with the potentially devastating consequences of a breakdown somewhere in the food safety web, have driven industry associations, sanitation and safety experts and watchdog organizations to establish guidelines not only for food handling, but for plant and process line design. Adhering to these recommendations can dramatically reduce the possibility of a devastating food safety event. Food safety hazards generally can be categorized as microbiological, chemical or physical. Most of the principles of safety revolve around the avoidance of entry, harborage or build-up in the facility — of anything that doesn’t belong, be it microbiological hazards, insects, rodents, plain old dirt, even unauthorized personnel. This principle is especially important at the points in the process where the product that will be ultimately consumed is most vulnerable. Whether your starting point is the facility, the people or a simple microbe, any piece of the food safety puzzle must be viewed as only a part of the total picture. Any complete food safety program should integrate employee programs, validated and verified processes, good manufacturing practices, sanitary equipment design, analyses of critical control points, and continuous improvement processes as well as sanitary facility design. HACCP programs ask processors to understand their food processes, to identify key areas of risk and to control potential contamination at those critical junctures. But don’t neglect key areas of the plant that may lie outside the map of HACCP target zones. Allen Sayler, senior director of regulatory affairs and international standards for the International Dairy Foods Assn. (IDFA), emphasizes the importance of safeguarding products beyond the borders of targeted “critical” control points. Such locales include storage areas for ingredients and ingredient blending areas, as well as the entire packaging area and finished product storage areas. “No matter how good the design of your plant or equipment is, if your employees are not trained in food safety, your operation is seriously at risk,” notes Craig Henry, vice president of the food safety program of the Food Products Assn. (formerly the National Food Processors Assn., still www.nfpa-food.org), Washington. Such training should include a plan for disaster, a written and well-studied recovery plan for a worst-case scenario. A sanitary plant design follows three broad principles: providing zones of control; controlling temperature and moisture; and designing to facilitate sanitation. This last point is enormously important. Essential to the concept of a sanitary design is thorough cleanability. That means a facility in which you can clean out and eliminate not only debris and chemical substances but tiny microbial invaders as well. Kramer emphasizes the critical importance of removing all food particles and preventing bacterial ingress, survival, growth and reproduction on both product and non-product surfaces. Such factors as traffic, airflow, temperature, moisture, nutrients, pH, and competing organisms must all factor into sanitary design planning. Food processes involving raw animal protein pose some of the greatest dangers of contamination in the food industry. Last September, the American Meat Institute’s Facility Design Task Force established Eleven Principles for Sanitary Design of Facilities. 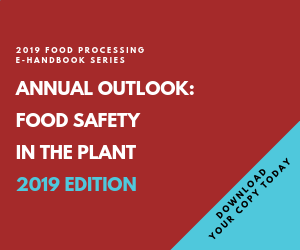 Though the principles are geared toward operations involving meat, poultry and other animal proteins, they highlight concepts that processors from any segment of the industry can employ to reduce contamination risk. 1. Distinct hygienic zones established in the facility. Maintain strict physical separations that reduce the likelihood of transfer of hazard from one area of the plant, or from one process, to another area of the plant or process, respectively. Facilitate necessary storage and management of equipment, waste and temporary clothing to reduce the likelihood of transfer of hazards. The essence of the “hygienic zones” principle is the strict control of the movement of people and materials through the plant to prevent contamination and its spread. People can be intentional or unintentional carriers, staff personnel or visitors, involved or uninvolved in the direct manufacture of food product. Materials include: raw materials, packaging materials, trash, rework, inedible matter, uniforms and clothing, maintenance materials and parts, and sanitation chemicals. This principle incorporates hazard analysis of critical control points (HACCP), places where the food product is most vulnerable to contamination or where contaminants are most likely to build up or make entry. From that analysis should flow a plan to reduce the likelihood of contaminants entering the facility, let alone the food product. Sara Lee’s Kramer emphasizes the concept of having “zones of control.” Identifying such zones as raw processing, clean room area, packaging, cook/chill, etc. is Step One. A logical process flow and control of movement from one zone to another will help determine prevention capability. Personnel facilities — particularly locker rooms, showers and restrooms — should not open directly into a process area. Add an ante-room or hallway for separation. 2. Personnel and material flows controlled to reduce hazards. Establish traffic and process flows that control movement of production workers, managers, visitors, QA staff, sanitation and maintenance personnel, products, ingredients, rework and packaging materials to reduce food safety risks. Once you have established control zones in the plant, you can introduce controls to manage the flow of materials and people between these zones. “You need to consider how personnel move in the plant,” advises NFPA’s Henry. This is particularly important in a plant with multiple processes, and particularly in a plant where you have two very different processes, such as a process for raw product and a second for cooked product. When personnel and materials move freely from one process to another, the odds of contamination rise exponentially. What would your USDA inspector find if he were to swab your equipment tomorrow? Photo courtesy of USDA. Sara Lee’s Kramer advocates clear and active separation between areas, where feasible, to pose more formidable barriers to the migration of potential contaminants. Recommended measures include separating chambers, magnetic locks and controlling access to areas with card readers. Heat treating equipment prior to its entry into a critical region is one way of ensuring safe transfer. Henry suggests “tenting” where possible — a process in which disassembled equipment is wrapped in polyethylene and blasted with steam as a sanitary measure. 3. Water accumulation controlled inside facility. Design and construct a building system (floors, walls, ceilings and supporting infrastructure) that prevents the development and accumulation of water. Ensure that the water positively drains from the process area and that these areas will dry during the allotted time frames. Temperature and moisture are critical to the growth of microorganisms. The drier your facility, the easier it will be to control microbial growth and dispersal. But keeping a plant dry is easier said than done in food processing environments where water is an essential part of product, process and sanitation. “If you are designing a wet process, you need to manage the water flows to control the risks,” says Kramer. A sanitary design allows water to drain freely. “Pooling is a sign of trouble,” Kramer adds. 4. Room temperature and humidity controlled. Control room temperature and humidity to facilitate control of microbial growth. Keeping process areas cold and dry will reduce the likelihood of growth of potential airborne pathogens. Ensure that the HVAC/refrigeration systems serving process areas maintain specified room temperatures and control room air dew point to prevent condensation. Ensure that control systems include a cleanup purge cycle (heated air, make-up and exhaust) to manage fog during sanitation and to dry out the room after sanitation. Maintaining optimum temperatures and humidity for the product at each stage of process and handling goes a long way toward ensuring product safety. Each microorganism has a temperature range within which it can be controlled best. Preventing fog and condensation build-up reduces the chances that microorganisms will multiply. 5. Room air flow and room air quality controlled. Design, install and maintain HVAC/refrigeration systems serving process areas to ensure air flow will be from more clean to less clean areas. Adequately filter air to control contaminants. Provide outdoor makeup air to maintain specified airflow, minimize condensation on exposed surfaces and capture high concentrations of heat, moisture and particulates at their source. Air can be the primary source of mold, bacteria and other microbes as well as allergens and other potential contaminants. It also carries heat and moisture, which can endanger the quality or safety of the food product under some conditions. Good airflow and filtration is essential to a food-friendly plant design. Filtering air at 0.1 micron will remove bacteria, yeast, mold and most viruses. To view the related graphic (PDF format), click the "Download Now" button at the end of this article. Air quality should be at its highest level where the food product is most sensitive. That area is where the processed product enters the package, according to Graham, who held top technical and quality assurance positions with Green Giant of Canada and Pet Inc. as well as serving as senior food/sanitation technologist for Sverdrup Facilities. Maintaining sufficient positive air pressure is critical as well. 6. Site elements facilitate sanitary conditions. Provide site elements such as exterior grounds, lighting, grading and water management systems to facilitate sanitary conditions for the site. Control access to and from the site. A cockroach infestation could really mess up your day. To keep roaches out of your plant, read this section and follow the recommendations closely. The outside area of the plant should be kept neat with bushes and trees — any object that might harbor pests — located away from the building. Employ bait boxes and traps where safe and practical and where regulations allow. Keep grass well trimmed and away from the plant. Keep pests out with adequate door seals. Door and window screens should use 22-mesh or finer material. Air curtains add an extra layer of protection. Outside lights should be situated away from the building so they do not attract insects to the facility. Carefully position insect electrocutors so they will not draw insects to food areas. If you are building a new facility, don’t locate near areas offering high risk of contamination, such as sanitary landfills, refineries, sewage treatment facilities, junkyards, etc. Surround the facility with fences and gates to limit access of outsiders. People access also should be controlled from the front gate and/or other key entry points. 7. Building envelope facilitates sanitary conditions. Design and construct all openings in the building envelope (doors, louvers, fans and utility penetrations) so that insects and rodents have no harborage around the building perimeter, easy route into the facility or harborage inside the building. Design and construct envelope components to enable easy cleaning and inspection. This seventh principle focuses on the skin or envelope of the food plant and involves effective control of what small invaders get in. Caulk or seal gaps at windows and doorways to prevent cavities where material build-up or pests can gather. “Get away from the stone-ballast-over-tarpaper-type roofs, especially over processing areas where you have vents,” advises Graham. Contaminants can and will gather in these vents, which are also very difficult to clean and welcome insects, rodents and birds. Such roofs interfere with draining and tend to leak easily. 8. Interior spatial design promotes sanitation. Provide interior spatial design that enables cleaning, sanitation and maintenance of building components and processing equipment. Sara Lee’s Kramer recommends 360-degree access and good spacing of equipment. All wall-mounted objects, including signs, sinks, electrical boxes and pipes, should have sufficient space — at least one to two inches — between them and the wall to make effective cleaning possible. Don’t leave nooks and crannies for material and organic build-up to occur. 9. Building components and construction facilitate sanitary conditions. Design building components to prevent harborage points, ensuring sealed joints and absence of voids. Facilitate sanitation by using durable materials and isolating utilities with interstitial spaces and standoffs. Give new meaning to the term "germ warfare" — defend against these invaders by insuring that surfaces are cleanable to a microbiological level and incorporate sanitation systems into your design. Construction of floors, ceilings and walls should leave no gaps or cavities for matter. Select materials that are resistant to wear and cracking. Seal seams and cracks, and apply epoxy or other coatings that improve wear and eliminate pockets for build-up. 10. Utility systems designed to prevent contamination. Design and install utility systems to prevent the introduction of food safety hazards providing surfaces that are cleanable to a microbiological level, using appropriate construction materials, providing access for cleaning, inspection and maintenance, preventing water collection points and preventing niches and harborage points. “This principle addresses the elimination of niches and harborages through proper specification of materials, finishes and sanitary design details of the utility system,” notes Kramer. Clean, uncomplicated lighting, piping and electrical configurations employing sanitary materials can vastly simplify cleaning and eliminate unnecessary potential for contamination. 11. Sanitation integrated into facility design. Provide proper sanitation systems to eliminate the chemical, physical and microbiological hazards existing in a food plant environment. Integrate all necessary sanitation systems including wash areas, steam systems, CIP systems, etc., into your plant design. “If you are likely to have a problem with pests, ask yourself how well your plant is designed for fumigation and have a plan to incorporate it,” says Henry. "You have to be prepared. You can’t just plan to fumigate on the weekend if a USDA inspector orders you to fumigate immediately or shut down the plant." Consider your traffic patterns, too, especially while different parts of the plant are being cleaned. Consider contamination possibilities at point of packaging. Packaging materials should not be stacked in a manner that puts non-food surfaces in direct touch with food contact surfaces. Henry echoes the refrain of all food safety gurus in summing the need for a comprehensive, coordinated effort.